Proper fractions : A fraction in which the numerator is less than the denominator. Here, the numerator is 2 and denominator 7. So, its a proper fraction. Improper fractions : A fraction in which the numerator is greater than denominator. Here the numerator is greater than denominator. So, its an improper fraction. (8 > 5) so its an improper fraction. Mixed fractions : A combination of a whole number and a proper fraction is called a mixed fraction. In other words, we can say that mixed fraction has two parts 1) natural number 2) proper fraction. 1 ⅓ , 2 ⅕ , 5 7/9 etc. Property 1: A mixed fraction may always be converted in to an improper fraction. Multiply the natural number by the denominator and add to the numerator. This new numerator over the denominator is the required fraction. 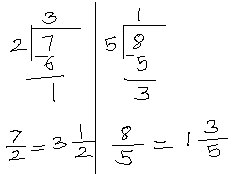 Example : A fraction like 7/2 can also be expressed as 3 ½ , or 8/5 can be written as 1 3/5. State whether the following fractions are proper or improper.